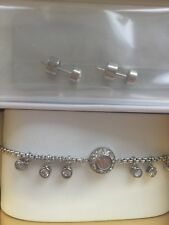 Amaxonite Necklace With stretch bracelet set of two, bracelet is on stretch jewellery elastic so fits most and the necklace has a silver clasp. Necklace approx 18 inch in length, no extender. The stones are presented in its rough cut form, has various markings which are a natural occurance and no 2 stones are same, all are of various shapes and sizes. Sent without box. Freshwater Pearl and Millifiori Glass. Necklace 22" and Bracelet 8". Presented In Black Gift Box (black velvet/sponge inner). 6mm Pearls. Pearl Colour: White. Pearl Shape: Round. Necklace Length: adjustable length from approx.40cm to 52cm (16" to 21") in Length. Freshwater Pearls in White. Double Threaded For Extra Strenth and Knotted At Each Pearl. Approximate Pearl Size Is 8mm. It features a pretty crystal set dragonfly pendant with chain, and matching crystal dragonfly earrings. All are made from 925 silver plate. and the earrings are 2.8 x 1.5cm. Or add us to your favourites list ! Pearl Shape: Round. Pearl Colour: White. Necklace Length: approx.38cm to 57cm (15" to 22") in Length. Or add us to your favourites list ! 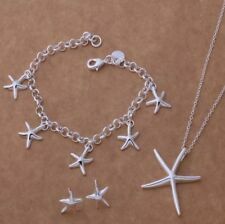 They are made from 925 PL silver. All are made from 925 silver plate. and the earrings are 1.5 x 1.3cm. All are made from 925P silver. and the droplet earrings are a hook design. The necklace features a delicate droplet pendant. The bangle features a pretty droplet either end, the matching ring is resizable. Presented with a quality purple velveteen gift pouch. 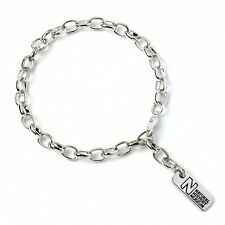 It features nickel-free silver plated chains and settings. Each piece has a lobster claw clasp. The bracelet length is 15cm plus the 5cm extender. All are made from 925P silver. and has matching daisy stud earrings. Freshwater Pearls in Pinks, Purples, and White. Double Threaded For Extra Strenth, and Knotted At Each Pearl. Approximate Pearl Size Is 8mm. Photos Have Been Taken With Flash On And Flash Off. Pearl Shape: Round. Hair Band: approx.27cm. Pearl Colour: White. Necklace Length: approx. 45cm to 55cm (17" to 22") in Length. Material: Rhinestone & Alloy. Necklace Length: approx.47cm (18"). Pearl Shape: Round. Pearl Colour: White. Freshwater Pearl and Millifiori Glass. Necklace 20" and Bracelet 8". Presented In Black Gift Box (black velvet/sponge inner). Other Beads: Clear Shamballa. Pearl Colour: White. Pearl Shape: Round. Necklace Length: adjustable length from approx.40cm to 50cm (16" to 21") in Length. 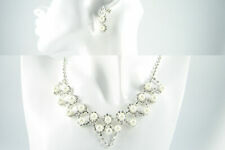 Material: Rhinestone & Alloy. Necklace Length: approx.45cm (17"). Pearl Colour: White. Pearl Shape: Round. Necklace Length: adjustable length from approx.40cm to 50cm (16" to 21") in Length. Freshwater Pearls In Pink. Necklace 18" and Bracelet 8". Presented In Black Gift Box (black velvet/sponge inner). Pearl Colour: White. Pearl Shape: Round. Freshwater Pearls With Green Glass Jade Teardrop Beads. 4mm to 6mm Pearls and 10mm Faceted Jade Teardrop Beads. Necklace and Matching Bracelet. Necklace 18" and Bracelet 8". Pearl Colour: White. Pearl Shape: Round. Necklace Length: adjustable length from approx.46cm (18") in Length. Pearl Colour: White. Pearl Shape: Round. Necklace Length: approx.45cm (18"). All are made from 925P silver. Or add us to your favourites list ! Material: Rhinestone & Alloy. Necklace Length: approx.50cm (20"). Freshwater Pearls In White. and Knotted At Each Pearl. Approximate Pearl Size Is 6mm to 7mm. Necklace is Double Threaded For Extra Strenth. Freshwater Pearls in Pinks, Purples and White. Approximate Pearl Size Is 7mm to 8mm. Presented in a Pretty Pink Gift Box With Bow and Ribbon. Pearl Colour: White. Pearl Shape: Round. Hair Band: approx.20cm. Necklace Length: approx. 45cm to 53cm (17" to 21") in Length. Saltwater Pearls in a Lilac Color. 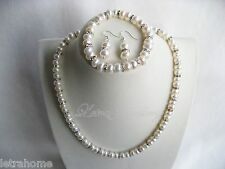 Approx Pearl Size Is 7mm to 8mm Presented in a Gift Box. Double Threaded For Extra Strenth, and Knotted At Each Pearl. Handmade ROSE QUARTZ Guardian Angel Wings Gemstone Bracelet Tibetan Silver Angel wings charm. Beautiful Rose Quartz Silver Plated wire wrapped Pendant Beautiful small drop dangly Rose Quartz Gemstone earrings. Snowflake Obsidian brings about a balance to body, mind and spirit. Snowflake Obsidian can remove negativity from a space or person with ease. In general, Obsidian is a very grounding and protective stone. Pearl Colour: White. Pearl Shape: Round. Necklace Length: approx.38cm to 57cm (15" to 22") in Length. Green Jade, Lobster Clasp. Necklace is Silver Plated 16" long.